This post was written Friday, August 5th, 2016, hence the title "Two Weeks". Today I drove north on I-65 after a brief visit with my Dad, and as I drove, I couldn't help thinking of the same drive north I took two weeks ago today, after a brief visit with both of my parents. Two weeks ago, I was driving north on I-65 not knowing that I just finished seeing my mom for the last time. My mom lost her battle to cancer on Saturday, July 23rd, 2016 surrounded by as many family and friends you could fit into one hospital room. Two weeks ago, life was normal. I drove to Atmore on Thursday at lunch to spend the night and spend some time with my parents. I went to the grocery store for my mom, I brought nail polish to give her a pedicure, but she laughingly told me she would rather I mopped her floors. So that's what I did. When I got home two weeks ago on Friday, I met Derek and a friend at our in-laws for an afternoon of shooting clay birds. Derek and I went out to eat wings afterward where we ate too much and stayed out too late, being that I had to work in the morning. My dad called my cell phone at 3:30 Saturday morning telling me the ambulance had just pulled out of the driveway to take my mom to the hospital. She couldn't breathe. She couldn't even walk to the car. As I was listening to my dad explain the situation, all I kept thinking was "None of this makes sense, I just left, I just saw her. She was fine when I left. She was fine when I left." About an hour later, I called back for an update and my dad let me speak to the nurse taking care of her because I would be able to understand her "nurse speak" better than he could. By then, I called my work to say that I wouldn't be there that day but I would probably be there Sunday, even then not realizing the severity of the situation. My mind still saw the woman who hugged me before I left and told me she'd see me Tuesday for her doctor's appointment. I remember every detail from the moment we arrived to the hospital, to the moment we left, nearly 10 hours later. I remember holding my dad's hand, I remember praying with our preacher. I remember begging God to let my brother making it in time to see her (he didn't), I remember the last time my mom looked at me before she closed her eyes. Those things I will never forget. I will never forget the love I felt that day. I could physically feel it enveloping me, holding me tight and keeping me safe. I could feel God's presence and His love as well. I could never describe in words the moment her soul left her body, but my immediate feeling was one of relief. I know it sounds strange and maybe only those who have held another's hand as they left this earth can understand, but it was such a relief to know that there would be no more pain, no more tests, no more waiting or wondering. To everyone that called, texted, emailed, sent carrier pigeons, or otherwise offered condolences, prayers, and support, I sincerely thank you from the bottom of my heart. There were many people whom I did not respond to during the last two weeks, but please know that your words meant so much to me, and I could never thank you enough for sending them. Every day is a struggle, and every day I miss her. 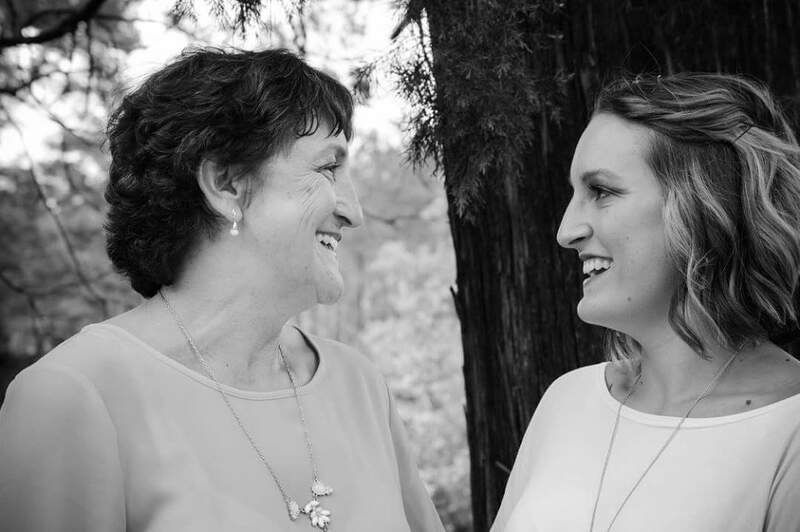 Most days her death doesn't feel real to me, it feels like some kind of joke because I can still hear her voice and her laughter. I can still feel her presence and feel the love she had for her family. As of today it has been 24 days without her, it seems like such a long time but really the days are going by so quickly. I will never get over the loss of my mother, but I think that with time I can learn to accept it. Last month, I took a deep breath, walked in to my boss's office, and quit my job, and today is my last day. It was the single most nerve-wracking thing I have ever done in my life. Not just the moment where I turned in to my notice, but the days and weeks leading up to that moment...the thinking, the praying, the guilt. These things made it the hardest decision of my life. For a little bit of background information, I'm a registered nurse, and I work as a unit manager at a long term care facility (nursing home). This nursing home is where I started my very first job as an LPN, and after I graduated the second time, I was promoted to being a manager. I love my job. I love the people, the atmosphere, but mostly I love the residents who lived at the facility. They were (and still are) so special to me. 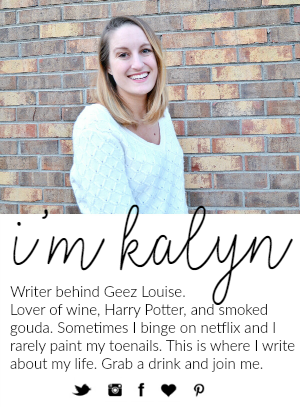 Maybe you're thinking, Kalyn if you love your job so much, why did you quit? There were, at the time, what seemed like a lot of factors. Looking back, they seem like little things, but at the time they were big things. I was overwhelmed. Overwhelmed not only with my job responsibilities, but with my life. I needed a change: a change of scenery, a change of pace. As I mentioned, it was a tough decision. There was a lot of talk with my husband, my family, and much more praying for guidance. I wanted to know that I was making the right choice. You know the analogy people always give with the oxygen masks in the airplane? This was that kind of situation. I couldn't take care of other people without first taking care of myself. 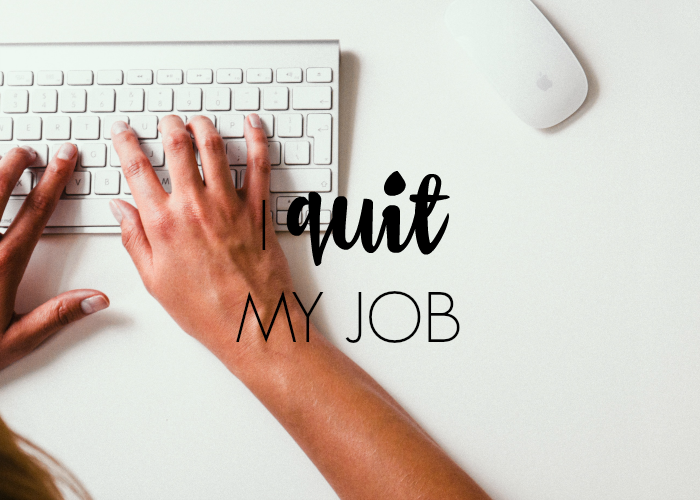 There are some people that don't "get it" when I explain that I'm making a personal decision to step back, or take a "demotion", in my new job title, and that's okay. Not everyone understands needing a little bit of self-love. Not everyone understands that life can sometimes take harder tolls on me while it doesn't affect you at all. This last day of work is so bittersweet. I have heard the kindest words over the last few weeks and those words really make me feel good. I've been encouraged and reminded why I first chose to become a nurse. I'm excited to be taking the next step in my nursing career, and I'm excited for the new opportunities I'll be provided. Amidst all the excitement though is just a little bit of sadness at leaving my first "real" job and workplace. I ask that you keep me in your prayers as I begin this completely new journey. April has always been my favorite month. It's finally warm enough to go outside in a tank top and shorts, all of the flowers are blooming, and it just so happens to be the month I celebrate my birthday (April 2nd, if you're curious). The month of March really went by quickly. I went on vacation with good friends, we worked a lot on our house, and I made a pretty big life decision, which I will talk about at a later date. 1. Establish a cleaning schedule (for real). I'm just going to face it, me and schedules don't mix. I attempted to make a cleaning schedule and stick to it, but life usually got in the way. I am happy to report, however, that I did consistently do more chores during the week to free up our weekends, so I'll say this one is COMPLETE! 2. Paint the guest bedroom. We did not paint the blue room, but we DID rip out the carpet and paint the room that will become my husband's office. I'm going to go ahead and say COMPLETE on this one too, because really it was just my goal to do something with our spare rooms. 2. Schedule (some of my) social media posts. I started using Hootsuite last month and I really enjoy it. I won't say that I scheduled posts every day or even for every blog post, but I did use it fairly consistently to promote not only my blog, but some of my favorite bloggers/blog posts throughout the month. COMPLETE! 3. 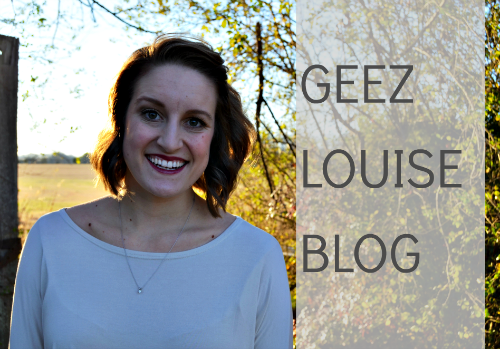 Have blogger collaborations. I totally dropped the ball on this one. Establish a gym v. running routine. Right now I kind of just run when I feel like it, but with two races coming up, I need to focus on endurance. Spend quality time with my husband, work on developing our love languages and improving our communication skills with each other. Increase my instagram following and engagement. Since April 2015, my instagram account has doubled in followers, and I've done that all on my own! I want to continue to focus on posting quality photos, using relative hashtags, and engaging other accounts. My goal is to grow my account by 100 followers. Work on an editorial calendar that works for me. I attempted last month to make one, and it just didn't work out. Create and host a link up in the beginning of May. 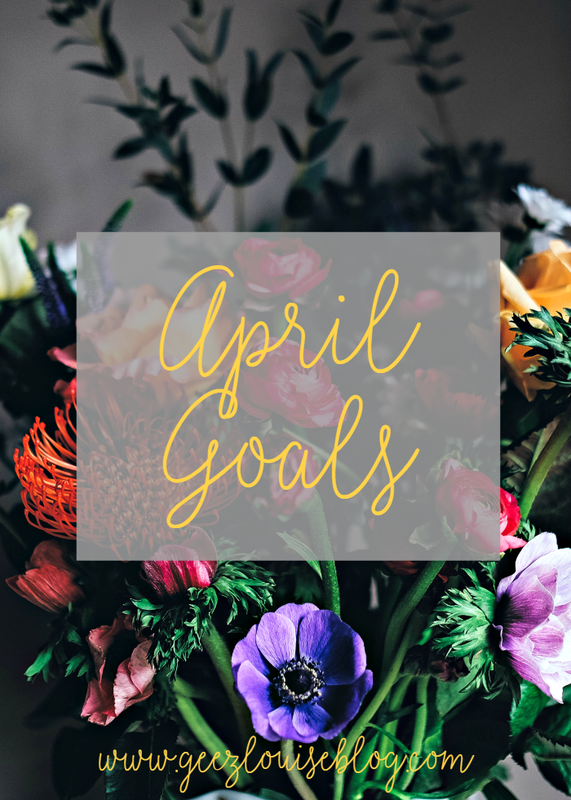 I know this is April, but in order for it to happen in May, I need to do all the planning in April. When I was a teenager and when I was in college, credit cards scared the heck out of me. I associated credit cards with debt, collection agencies, and spending money you didn't have. In my 18-21 year old hands, a credit card could have been very dangerous. I know many people who got themselves in over their heads with credit cards when they were younger. Some with a balance of $500-1200 they could never shake, but some getting up to ten thousand dollars in debt. I knew I didn't want to get myself into that kind of situation, so I never applied for a credit card. Even after I graduated college, got a job, and my own apartment I still wasn't comfortable with the idea of having a credit card. I had a student loan and also a small bank loan that I paid off when I was 19, and these two loans helped boost my credit score, along with paying my electric bill and my apartment rent. When my husband (then boyfriend) and I first applied for a mortgage we ran into a little bit of a road block...Derek didn't have any credit! Like me, he never had a credit card, and didn't have student loans, and on top of that he lived with his parents or in a home owned by his parents throughout college. He was advised that the quickest way to build credit was to get a credit card. I told him to go for it, but I didn't want any part of it. For six months he put all of his gas on the credit card, paid the balance in full every month, and was able to build up a good credit score. Fast forward several years, and now I exclusively use my credit card, and I never touch my debit card (unless for some reason I'm needing cash or using a cash back option). So what made me change my mind? In short, the answer is: FREE MONEY! Reward points are so awesome you guys, I mean, you are literally getting money for free. Anyway, we started with an American Express card for Costco, because at the time, Costco had an exclusive contract with AmEx, and it was the only credit card accepted. There was no annual fee, and we got an immediate $100 bonus if we spent X amount in the first month. We used it every time we went to Costco, for all our gas purchases, and for some restaurant purchases. 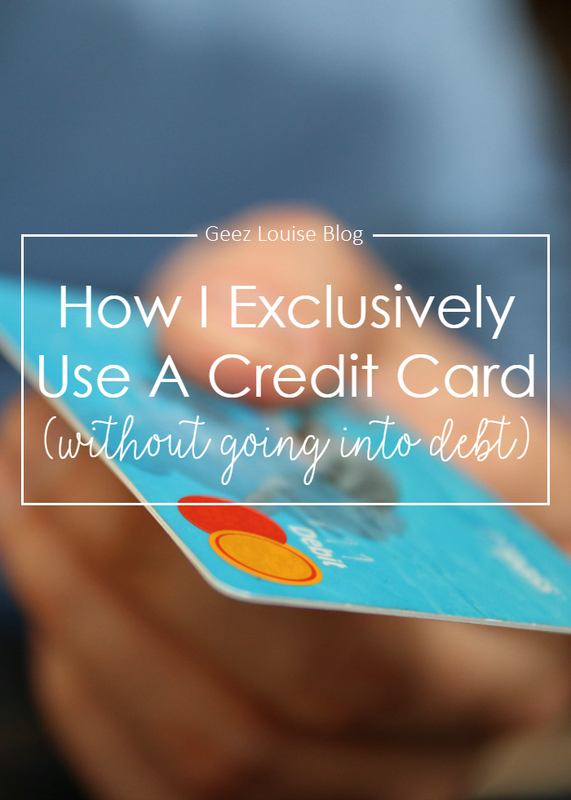 I was still using my debit card more frequently than using the credit card, so I never really knew how much money we had, and it was frustrating! So we quit using the CC except when we went to Costco. Six months later we went to Canada, paid for our tickets out of pocket, along with our hotel in Calgary and our rental car. After talking at length when we returned from our trip, we decided to give another go with using a credit card to build up reward points. We did a lot of heavy research to figure out which credit card would work best for us. We chose the Capitol One Venture, which is a Visa. It has 2% cash back on everything, a low annual fee, and a $400 sign up bonus if we spent $3,000 in the first month - this worked for us because that's the month we went to Vegas and we put our airline tickets, hotel, and all other expenses on the card to help us get to that amount. After we both got our cards we started using them exclusively, instead of only with certain purchases. We don't use any money from our bank account, and we don't spend more on our credit card than we get paid every month. It's really as simple as that. When you treat your credit card just as if it were a debit card (spending only what you have available) it can really work out in your favor. Since September of last year, we've earned over $900 in rebates. That's about $150 per month that we get back, just by spending money on things we were planning on purchasing anyway. We haven't used it all yet, but we plan on using it toward travel in the upcoming year. I mentioned in an earlier post, that while we were in Orlando, we stayed at Cabana Bay Beach Resort, which had an awesome perk of allowing early access to guests to Universal Studios. Again, I highly recommend this hotel, not just for the perks, but because it was within walking distance, was very clean, and the pool(s) were awesome. The first morning in the park, we were at the gate right at opening and went straight for Daigon Alley and the Gringott's ride. The detail work in the bank itself was really awesome, the goblins working as 'tellers' were very lifelike and would occasionally glare at you. The ride was a mix between virtual and rollercoaster, and it was really, really good. Florean Fortescue's Ice Cream Parlour where you could get various ice cream flavors including butterbeer, earl gray @ lavender, and clotted cream. Olivander's Wand Shop, where you can experience someone choosing their wand - or rather, the wand choosing them. We also went to Weazley's Wizarding Wheezes, which is the shop opened by Fred and George Weasley with Harry's Triwizard Tournament winnings. The shop looks nearly identical to how it's portrayed in the movies - down to the disappearing rabbit under the hat and the unicycling Umbridge going across the ceiling. 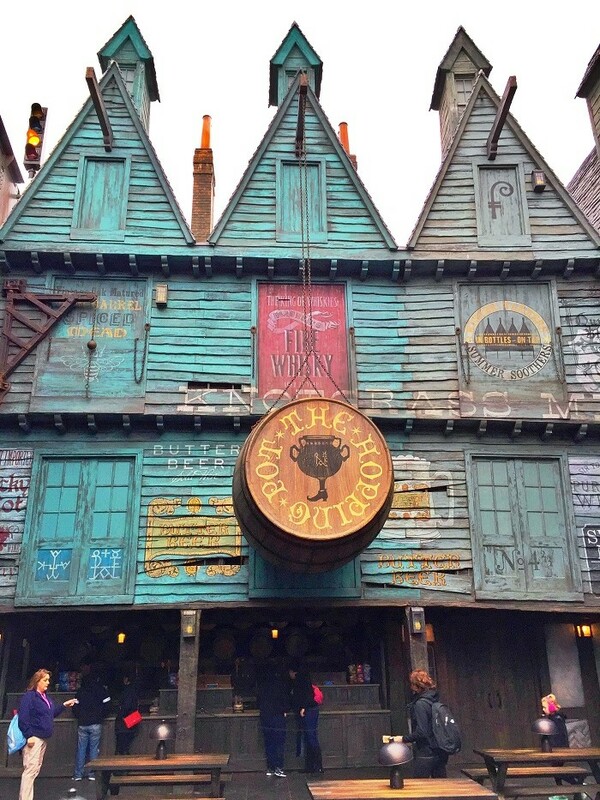 What I didn't know before going to Diagon Alley, is that you can also visit Knockturn Alley and Borgin and Burkes shop. It was pretty creepy/cool - not to mention that the vanishing cabinet is there and you can hear the bird tweeting inside it. There are tons of hidden gems inside Diagon Alley, including props from the actual movies, talking mirrors, and even a goblin from Gringotts that will answer your questions. 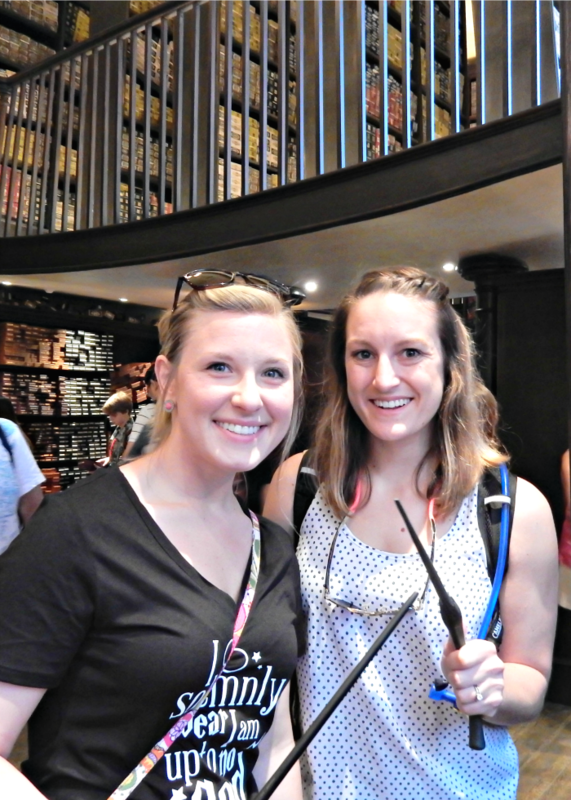 If you get one of the interactive wands, there are actually places throughout Diagon Alley where you can cast spells and see some fun things happen! The thing we waited forever to see was the dragon blowing fire. She blows it at totally random times, and we never did see it until our very last day there. It actually made the whole area of the park get warm. The dragon perched on top of the bank alone is enough to make you feel awed, but breathing fire really takes the cake. 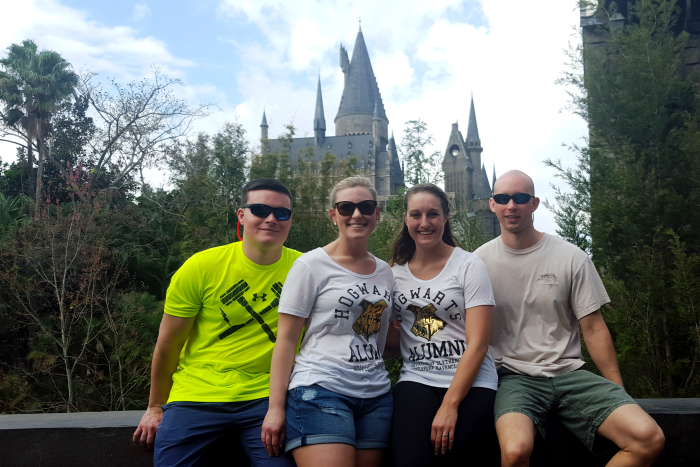 Of course we rode the Hogwart's express (we actually rode it from Hogsmeade to Diagon Alley at the end of the day) and the Forbidden Journey ride in Hogwarts. Riding the Forbidden Journey was even more magical than the first time because the wait was only FIFTEEN MINUTES rather than the 2 hours it took when we went in 2014. Don't ask me how we got so lucky. We also rode the Dragon Challenge several times, I never could decide whether the Chinese Fireball or the Hungarian Horntail was the better one. We didn't eat in The Three Broomsticks, only because we were planning on eating in the Leaky Cauldron, and the food was essentially the same. 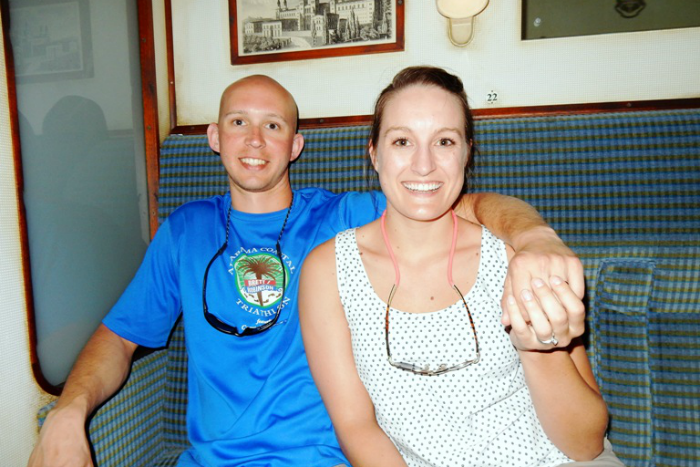 We DID however, drink tons of butterbeer while walking through Hogsmeade. 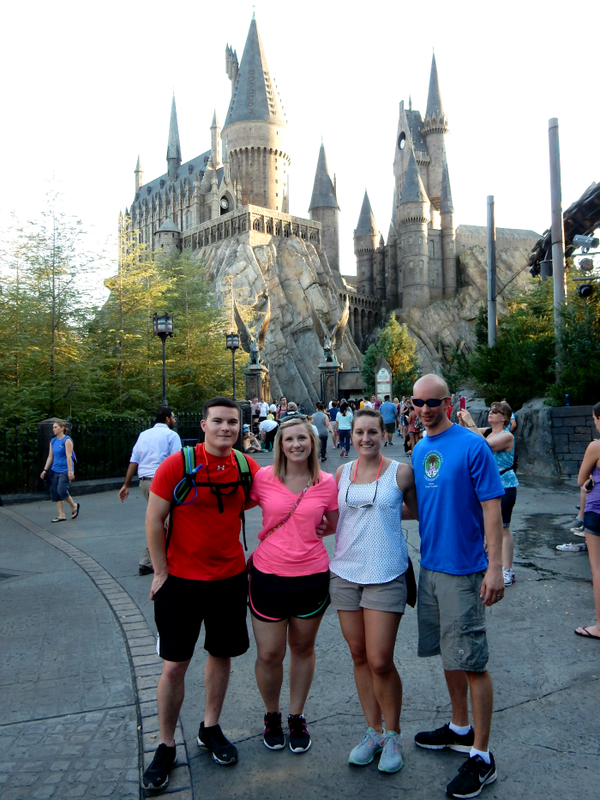 We rode the Flight of The Hippogriff and got to walk by Hagrid's cabin. I thought the ride was a 'kiddie coaster' but it was actually really fun. 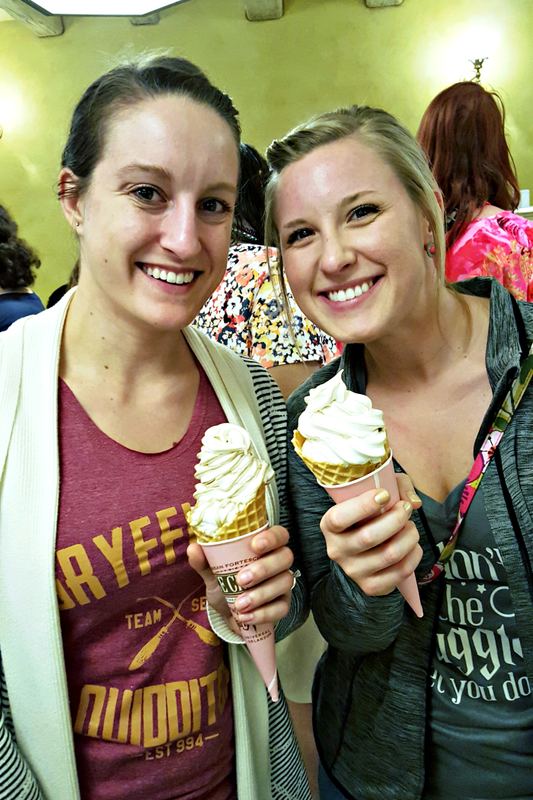 And of course we stopped by all the fun shops like Dervish and Banges, Filches Imporium of Confiscated Goods, and got us some yummy treats at Honeydukes shop. We had an amazing trip, and I can't wait to go back (although Derek says it will be several years). 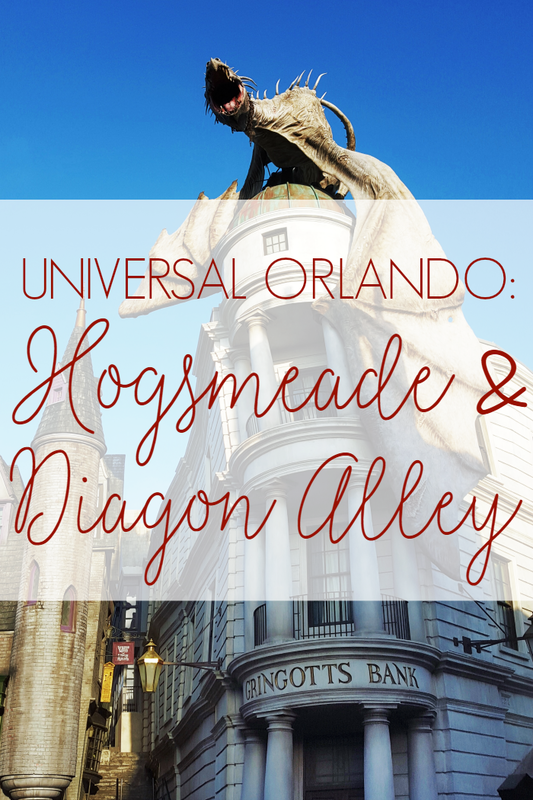 Have you ever been to the Wizardign World of Harry Potter? What was your experience?